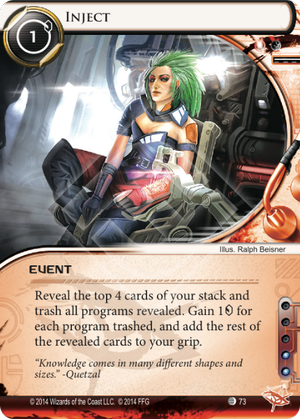 Reveal the top 4 cards of your stack and trash all programs revealed. Gain 1credit for each program trashed, and add the rest of the revealed cards to your grip. For Anarch, this is much needed in-faction draw power, cheaper than Quality Time and is multi-modal, so provides different uses depending on the deck design. • Cheap dig for four cards. • Mills programs for a little money (less payout than Freelance Coding Contract). • Draw, conversely, any Hardware, Events and Resources you see. • Programs are, by far, the easiest card type to retrieve from trash heap. • Costs 1[credit], so not a great money maker (likely worse than Easy Mark / Cache). • The Runner heap is 'vulnerable' (now) to Chronos Project. • The cards are revealed, so you're giving away information (a non-surprise Account Siphon is far harder to achieve). • Makes for an excellent 2 Influence splash into Exile: Streethawk; he wants Programs in the heap to enable his ability. • Weakly combines with Motivation (you see at least one card before Injecting). • Clone Chip can pull back a Program before the Corp can respond. • Anti-synergistic with Oracle May (she trashes bad "guesses"). • For guaranteed draw you're still better off with Diesel (0[credits]/••) or Quality Time (3[credits] /•). (1) For a deck with a lot of expensive programs, you can Inject early game and quickly Retrieval Run. (2) If you want to have a higher chance of abussing Test Run combos, you can Test Run on a turn; and on the next turn then Inject to trash the program and Retrieve.